Outboard Side Mount Control. 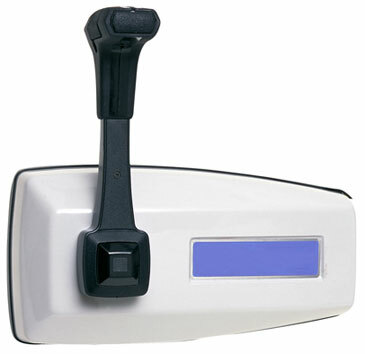 This economical single lever, dual function control features positive shift detents, an optional engine trim switch in the handle and easy installation. (Mounts to gunwale surface — no hole cutout required.) It’s an excellent replacement for both outboard and stern drive controls using universal (3300/33C type) cables only. Dual-function control — each lever controls throttle AND shift. Virtually all single-station outboards and stern drives with mechanical transmissions. Single lever, dual action design controls throttle and shift with one lever. Utilizes 3300/33C type “universal” engine control cables only. Not suitable for use with Mercury® and OMC® OEM type control cables. • Single lever, dual action for throttle & shift. • Surface mount design for quick, tidy installation. • Includes neutral warm up capability. • Includes hardware for two 3300/33 control cables. • Positive shift detents and neutral lock- out. • Optional neutral safety switch. • Weather resistant exterior, rugged die cast frame.